US Navy warships have begun escorting British-flagged commercial cargo vessels through the Strait of Hormuz, Pentagon announced. It follows last week’s seizure of a Marshall Islands-flagged vessel by Iranian Revolutionary Guard boats. Army Colonel Steve Warren, a Pentagon spokesman, said the US Navy had been asked to accompany the British ship through the Strait of Hormuz, a key oil passageway off the coast of Iran, which Tehran previously threatened to shut off. "They've asked if we would accompany their flagged vessels through the strait," Warren told reporters. “It’s a key concern of the United States to ensure that sea lanes remain in the region open and safe,” Jeff Rathke, US State Dept. spokesman, said Tuesday adding that the US has a security agreement with the Marshall Islands on defense issues. On Monday, the Iranian destroyer, Alborz 72, warned two P-3C Orion maritime surveillance planes and a USS Winston S. Churchill (DDG-81) destroyer against coming within the standard five-mile distance of the Iranian Navy's 34th fleet based in the Gulf of Aden, the IRIB TV reported on Tuesday. “We are duty-bound to monitor any foreign warships in international waters as well as anything that would threaten Iran’s national interests,” said the commander of the 34th fleet, Captain Mostafa Tajeddini. He stressed that Iran’s presence there falls in line with international law. According to the Iranian media the US warship and planes redirected their courses on Tuesday morning. Last week the Maersk Tigris vessel was forced to divert its course to near Larak Island off the port of Bandar Abbas on Iranian southern coast. The Maersk Tigris and its 24 member crew remain in Iranian custody as a result of what local officials have said is unpaid debt from a decade ago. Shipping company Maersk Line said Monday that its representative met with Iran’s Ports & Maritime Organization (PMO) but that little progress has been made. "We have yet to receive any written notifications [court ruling, arrest order or similar] pertaining to the seizure of Maersk Tigris or the cargo case," they wrote in a statement. 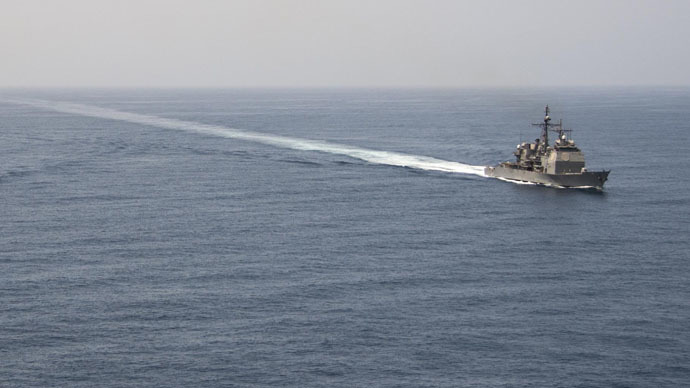 The US Navy typically maintains a routine ship presence in the Persian Gulf and the North Arabian Sea, but last Thursday it started accompanying US commercial vessels passing through the Strait. This all comes at a moment of delicate diplomacy as Iran continues talks with the six world powers on the development of a nuclear deal with a June 30 deadline. Furthermore, the region is facing heightened tensions as a result of the conflict in Yemen where the Saudi Arabia-led coalition is bombing Houthi rebels. Human Rights Watch reported on Sunday that the coalition is using US-supplied cluster munitions.